A six year drought in California was finally declared over this year but the threat for the south-western state as well as other locations in the world remains the same. 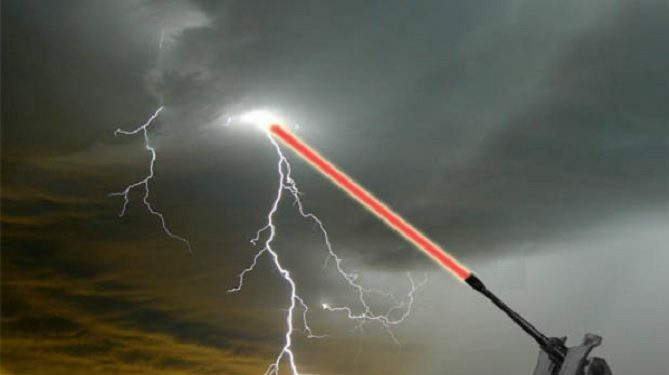 Experts from the University of Central Florida and the University of Arizona believe that by firing a series of laser beams, they can activate the static electricity and induce rain and storms. One beam would be fired, and this beam would be surrounded by another beam which acts as an energy reservoir – which will allow the laser to be sustained for longer and prevent dissipation. Laser beams can travel vast distances, but “when a laser beam becomes intense enough, it behaves differently than usual – it collapses inward on itself,” said Matthew Mills, a graduate student in the Center for Research and Education in Optics and Lasers (CREOL). When it reaches that point, the laser tries to spread the beam out and eventually collapses in on itself. This struggle is known as “filamentation” and creates a “light string” that only lasts for a short time before it disperses. Mr Mills said: “Because a filament creates excited electrons in its wake as it moves, it artificially seeds the conditions necessary for rain and lightning to occur. “It turns out that if you wrap a large, low intensity, doughnut-like ‘dress’ beam around the filament and slowly move it inward, you can provide this arbitrary extension. “Since we have control over the length of a filament with our method, one could seed the conditions needed for a rainstorm from afar.